Wolves defeated Manchester United for the second time in a fortnight as they added a Premier League victory to the FA Cup defeat they had already inflicted on Ole Gunnar Solskjaer’s men this season. The visitors looked well set for revenge when Scott McTominay finished well for his first United goal on 13 minutes, but Diogo Jota capitalised on a terrible mistake from Fred to equalise for the hosts just over 10 minutes later. United enjoyed more possession even after that, but their task was made harder when Ashley Young became referee Mike Dean’s 100th Premier League dismissal early in the second half. Wolves failed to create a huge number of chances against the 10 men, but secured the three points when Chris Smalling turned a Joao Moutinho cross past David de Gea and into his own net with 15 minutes remaining. Wolves stay seventh and have an FA Cup semi final to prepare for, while United lose important ground in the race for a top-four spot. 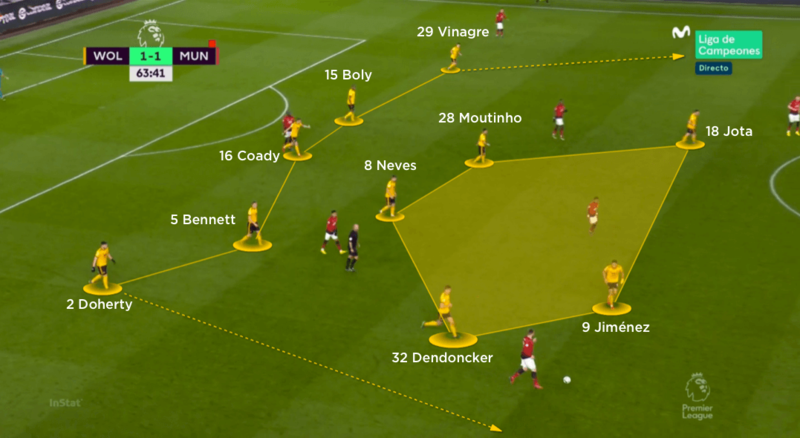 Nuno Espirito Santo set Wolves up in a 3-5-2 system in which wing-backs Matt Doherty and Ruben Vinagre moved as high as possible, pinning their direct Manchester United opponents deep. 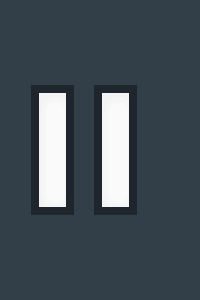 As a result, gaps for progression came in the inside channels and around the sides of United’s central midfield trio. With one of Ruben Neves or Joao Moutinho dropping back to help build against United’s two forwards, however, the hosts lost numbers in central midfield and struggled to progress the ball forward.  Eventually, movements from their two forwards, Raul Jimenez and Diogo Jota, away from the visitors’ central defence provided a link to bounce for additional runners from midfield. With both Neves and Moutinho operating in midfield when Wolves were defending, they were naturally much higher after a regain of possession. As a result, the hosts threatened more in transition, when Jimenez and Jota had runners in support. It was from a United mistake that the hosts found their equaliser, however; a poor touch from Fred led to Jota being played in behind to score from close range. 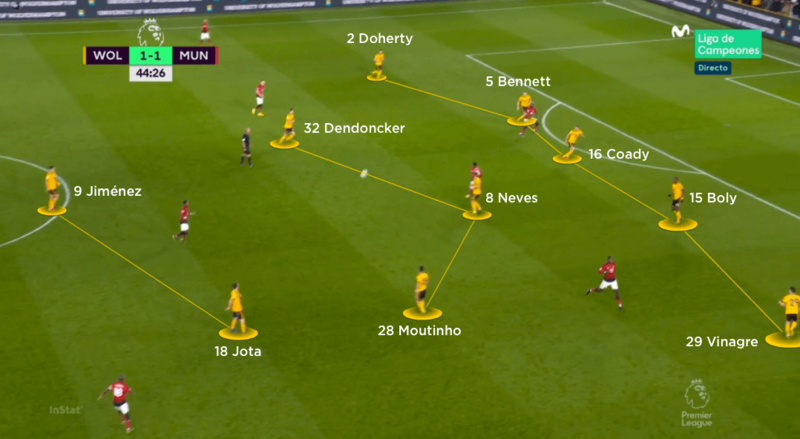 Nuno’s men continued to look to moments of transition for their attacking thrust, although early in the second half they moved their focus from central combinations to direct passes in behind the United wing-backs. 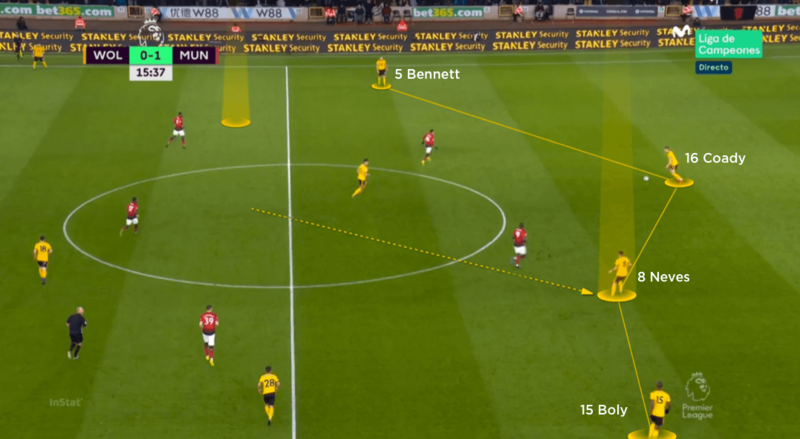 They stayed in their deep block even after the dismissal of Ashley Young, with Neves continuing to drop deep – as a result, Wolves often had four or five players behind the ball during their build, with only substitute Anthony Martial remaining high for United. Only when Neves finally moved higher and helped switch play out to Moutinho did Wolves threaten; the latter’s fizzing delivery caused mayhem in the United box, with Chris Smalling eventually putting through his own net to gift the home side another impressive three points in their bid to claim seventh spot. Without the ball, Doherty and Vinagre dropped into a back five as the hosts formed a 5-3-2 mid-block. As United set up in a similar attacking structure, Jimenez and Jota found themselves in an underloaded press against the visitors’ back three. With Young taking up such a wide position on the right during United’s build, Wolves were vulnerable to switches out towards their left. They preferred to block off the central lane and remain compact between the lines, however, thus restricting United’s more creative midfielders in advanced positions. This led to more wide play from the visitors, from which both Romelu Lukaku and Jesse Lingard missed close-range headers inside the six-yard box. Vinagre in particular had trouble dealing with Diogo Dalot, who put in a number of good crosses from the United right. Wolves retreated into a deeper block in the second half, to nullify any threat United posed in behind. They conceded most of the early possession, but their central compactness frustrated the visitors, with both Lukaku and Lingard drifting wide just to get on the ball more. Despite numbers in central areas and around the penalty area, they still looked vulnerable to crosses – goalscorer Scott McTominay should have headed United back in front at 1-1. 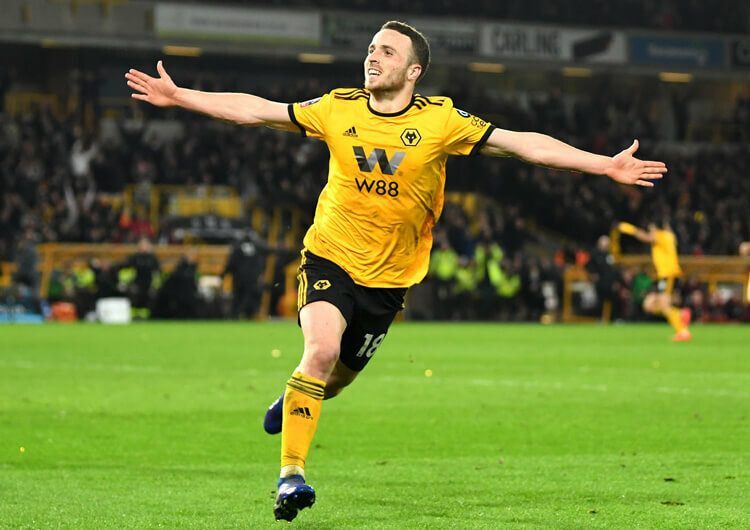 Once they got their second, however, Wolves never looked likely to concede again; they remained resolute to add a league win to the FA Cup defeat of United just two weeks earlier. 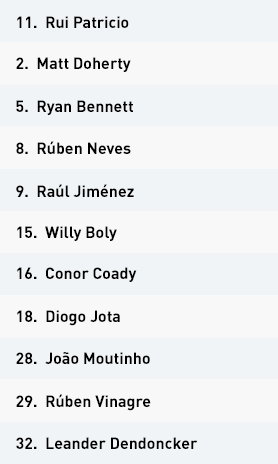 Wolves set up in a 3-5-2 formation, but one of Ruben Neves or Joao Moutinho too often dropped from midfield into the back line. 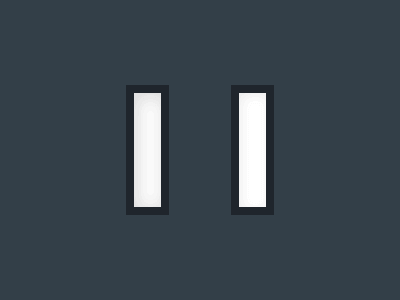 The hosts then had fewer players to play around their opponents’ midfield unit. 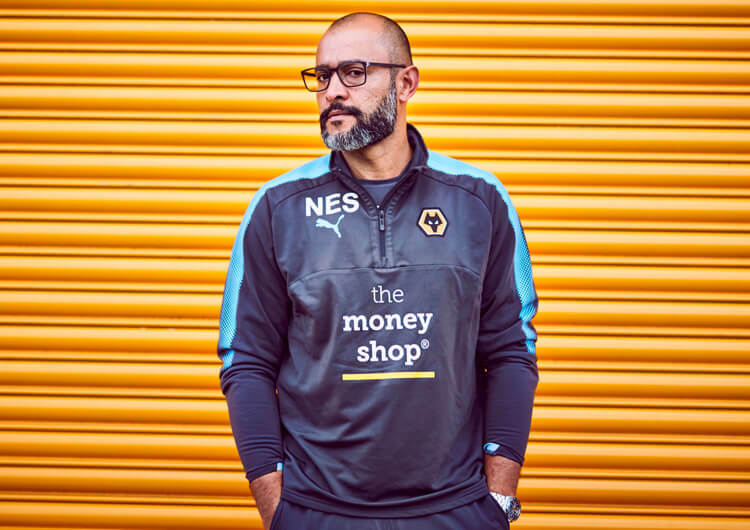 Nuno’s team utilised a 5-3-2 defensive block out of possession. This gradually deepened as the game went on, limiting the effect of direct balls into Romelu Lukaku or in behind for Jesse Lingard. The hosts formed a compact low block in the second half, with their attacking transitions focused on the wide areas. Wing-backs Matt Doherty and Ruben Vinagre were the main targets, in behind the higher positioning of counterparts Luke Shaw and Diogo Dalot. Manchester United set up in a 3-5-2 formation, but Ashley Young’s wider position on the right side of the back three enabled him to step into midfield and play direct balls into the front line – most notably Romelu Lukaku. 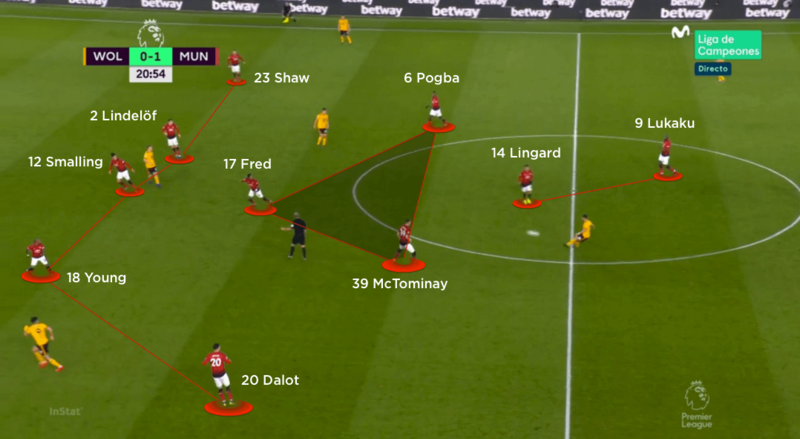 The visitors dropped into a 5-3-2 mid-block off the ball, although Wolves rarely had enough numbers around the central midfield trio of Paul Pogba, Scott McTominay and Fred to create much between the lines. Forwards Lukaku and Jesse Lingard moved away from Wolves’ compact block in an attempt to get on the ball more. 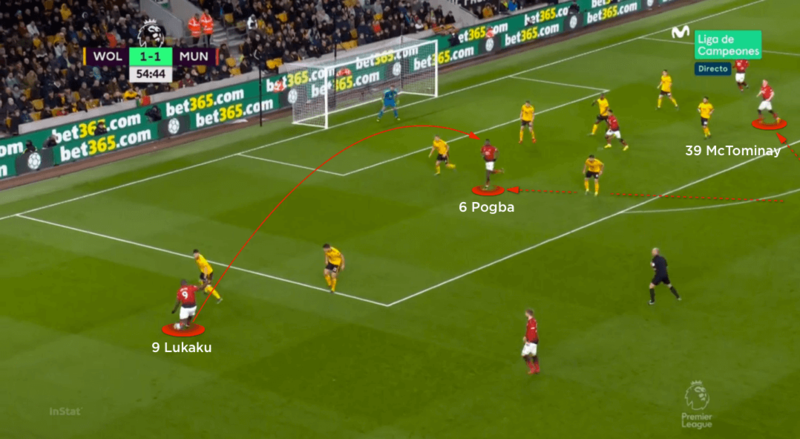 Pogba and McTominay then looked to get into the penalty area to attack any subsequent crosses, with Wolves struggling to prevent deliveries from wide. 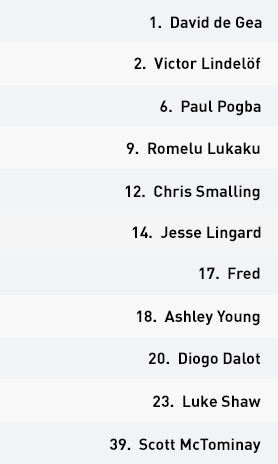 Ole Gunnar Solsjkaer set Manchester United up in a 3-5-2 attacking shape, with central midfielders Scott McTominay and Paul Pogba moving wider ahead of Fred, and Jesse Lingard roaming across the front line. Their early attacking play was focused on long passes into Romelu Lukaku, who could then link with the wider central midfielders or attacking wing-backs Luke Shaw and Diogo Dalot. Ashley Young also took up much wider positions from the right side of the back three, from where he could escape the attentions of Raul Jimenez and Diogo Jota and step forward into midfield against little pressure. This created further links with both Lukaku and Lingard, who offered direct runs into the spaces behind Wolves’ back line. These switches out to the right also opened up crossing opportunities for Dalot, although it was a shorter switch into the central lane that opened up space for McTominay to drive a low shot past Rui Patricio for the opening goal. It was a deserved lead, but it lasted less than quarter of an hour – and once Wolves had equalised United struggled to create any decent first-half chances. As the hosts dropped deeper in the second half, United enjoyed good possession but struggled to do much with it. 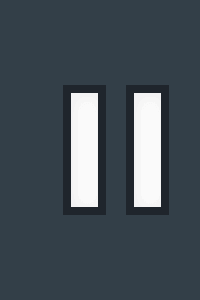 Lukaku, Pogba and Lingard rotated to get on the ball more, but often in unthreatening positions – and the receiver rarely had additional movements to look for ahead of the ball. They did create one excellent chance for McTominay, after Lukaku’s cross had been flicked on by Pogba, but the Scot failed to add to his first-half strike – and, after the dismissal of Young for two quick yellow cards, the visitors created few opportunities of note in falling to a second defeat in their last three league games. Out of possession, United converted into a 5-3-2 shape, forming a mid-block where possible. The immediate transition into their defensive structure proved vulnerable, especially as Pogba and McTominay moved higher as the first half progressed. 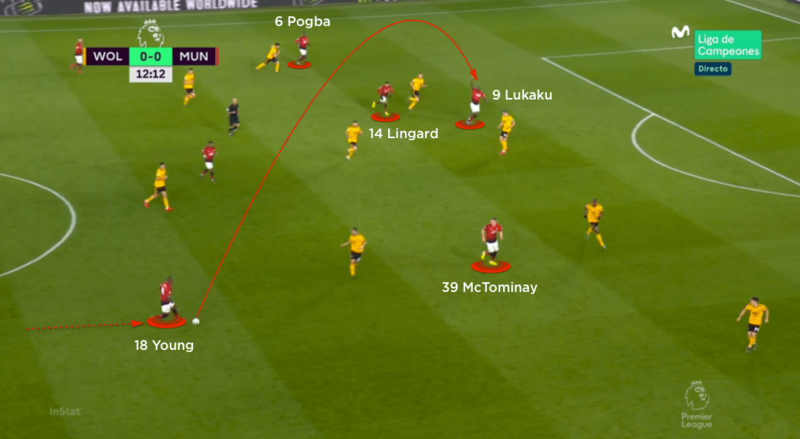 Wolves’ front two were happy to leave Chris Smalling and Victor Lindelof alone, knowing neither wanted to move up into midfield with the ball – but this meant that when the hosts won the ball back in midfield, they had numbers nearby to link with. This did, however, mean that Wolves lacked a presence in behind the United defensive line. Despite nullifying the majority of Wolves’ attacking play, United gave away a sloppy equaliser when Fred’s poor first touch was punished by Jimenez slipping Jota in behind to slide past David de Gea. Their task was further complicated after Young’s red card early in the second half; Phil Jones took his place in the back five, with Fred withdrawn and Lingard initially recovering deeper in what was now a 5-3-1 still focused on restricting the Wolves wing-backs from penetrating. They managed this well for much of the remainder of the game, but one loss of concentration on a Moutinho cross cost them dear when Smalling and de Gea combined for the former to put through his own net.